Former Iowa football coach Hayden Fry saw something special in Bo Pelini when Pelini played free safety at Ohio State from 1987-90. Fry saw the rugged tenacity. He noted the intelligence and savvy. Maybe the Ohio kid would be a good head coach someday, Fry surmised. "I was raised on a farm (near Odessa, Texas)," Fry said Monday. "My daddy told me when I was just a kid, he said, 'Son, I don't know what you're going to do or become when you grow up. But if you're going to be a winner, if you're going to be successful, you've got to surround yourself with winners.' That became my philosophy. I hired coaches who were just super folks." In 1991, Fry gave Pelini his first coaching job, as a graduate assistant for the Hawkeyes. Plenty of Nebraska fans would tell you Bo went on to become a pretty good head coach. The 82-year-old Fry, who retired in 1998 after two decades as Hawkeyes head coach, counts 21 of his former assistants who went on to become head coaches in college or the NFL. The list also includes Barry Alvarez, Bret Bielema, Jim Leavitt, Dan McCarney, Bill Snyder, Bob Stoops and Mike Stoops. Fry is rightfully proud of the list. Few head coaches could top that tree. 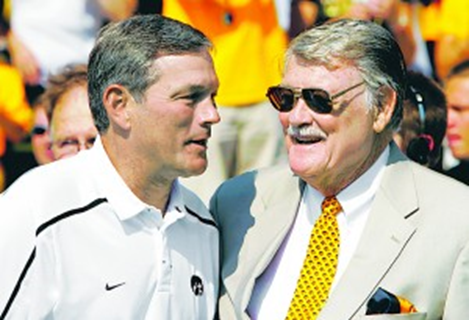 Upon retirement at Iowa, Fry recommended two coaches as possible replacements — Bob Stoops and Kirk Ferentz, who had been Fry's offensive line coach from 1981-89. Stoops, of course, took over as head coach at Oklahoma. Ferentz took the Iowa job and pushed the Hawkeyes to great heights — no surprise to Fry. "I never hired an assistant coach in my life, regardless of which position he coached, unless I was completely convinced that he was motivated to become a great head coach," Fry said. "Then I knew that he had really studied the game, that he'd be ethical, that he'd see that his players graduated. He'd do the things a head coach would do. "Kirk is truly an outstanding coach and outstanding gentleman. His players love him. When he tells them to do something, they do it." Nebraska fans are going to get to know Ferentz well in coming years. Fry, living on a ranch in Mesquite, Nev., is happy to help folks with the getting-to-know process. "It's really interesting how I hired him at Iowa," Fry recalled. "I interviewed quite a few coaches for that (offensive line) job. Some of them had been in the NFL. A couple of them had been head coaches on the college level. But when I interviewed Coach Ferentz, he was by far the best communicator of the whole group. "I had all of my candidates go to the blackboard and go through their technique of instruction. He had been a graduate assistant at the University of Pittsburgh. He was so organized and had such great ability to explain what he wanted done from an offensive lineman. I hired him right on the spot." No wonder Iowa often has had excellent offensive lines since Ferentz has been in the fold. The Hawkeyes produced the Big Ten Offensive Lineman of the Year in 1985 (Mike Haight) and 1986 (Dave Croston). With Ferentz running the program, Iowa has seen linemen claim the honor in 2002 (Eric Steinbach), 2003 (Robert Gallery) and 2009 (Bryan Bulaga). Entering 2011, Iowa's offensive line is arguably the strongest in the Big Ten, with starting experience at all five positions. Left tackle Riley Reiff is projected as an NFL first-round draft pick. James Ferentz, the coach's son, is one of the league's top centers. Iowa, thanks in part to a friendly schedule, could challenge odds-on favorite Nebraska for the Big Ten Legends Division crown. Unlike NU and Michigan State, the Hawkeyes play neither Wisconsin nor Ohio State. Is Ferentz loved by all Hawkeye followers? Probably not. Iowa hasn't won a Big Ten crown since 2004. However, Iowa fans should count their blessings that they have a strong, nationally relevant football program at a time when Hawkeye hoops is foundering. If both major programs break down simultaneously, the entire athletic department might go into a tailspin. So, Iowa fans, it never hurts to thank Fry. As the Hawkeyes' head coach, he breathed life back into a moribund program in the late 1970s and early 1980s. In doing so, he built a financial foundation that fuels the athletic department to this day. "I always thought he did a really good job with people — he was very detailed and he treated folks the right way," Pelini said Monday. Fry also listened to his father's advice. That was a huge part of it.